RIO DE JANEIRO, BRAZIL – As talks about Brazilian financing for the Uruguayan deep-water port of Rocha continue, concerns grow among Brazilian port operators, who worry that the super port could compete with the country’s own national interests in the future. Brazilian president Dilma Rousseff meeting with Uruguayan President José Mujica in 2012 to discuss energy, infrastructure and technology, photo by Antonio Cruz/ABr. Slated for construction in Rocha, located approximately 180km northwest of the Uruguayan capital of Montevideo, the port would be located only 100km from the Brazilian border and a mere 288km from a major Brazilian port located in the state of Rio Grande do Sul. According to current drafts, the Rocha deep-water port would have a depth of twenty meters. This would allow for the mooring of vessels carrying up to 180 thousand tons, while the southern Brazilian ports have a maximum depth of fourteen meters and can only receive ships with a capacity of up to 78 thousand tons. The Uruguayan government has also published estimates on its website that state the Rocha port would generate 87.5 million tons of cargo per year by 2025, whereas the Rio Grande do Sul port generated only 33.2 million tons in 2013. 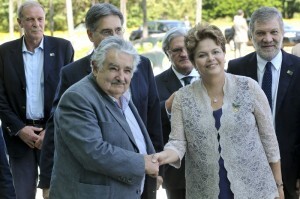 The President of Uruguay, José Mujica has reportedly visited Brasília several times to speak with Brazilian President Dilma Rousseff about financial support for the project. It is speculated that the money, if given, would come from BNDES (Brazilian National Development Bank) via the South American economic and political agreement Mercosul/Mercosur‘s Fund for Structural Convergence (Focem). In an open letter to President Rousseff, Sérgio Salomão, president of the Brazilian Association of Container Terminals for Public Use (ABRATEC) and Wilen Manteli, president of the Brazilian Association of Port Terminals (ABTP), expressed their concerns. The financial and technical details of the Rocha project remain under discussion.